It’s a rare day indeed when Bob Katter doesn’t sound like a barking mad homophobe bushie, but hey, did I just spot a blue moon ? Did you see his rant on the TV a few days ago apropos the nurse returning from West Africa in Townsville coming down with a fever and being suspected of having a dose of Ebola virus ? A whole raft of people in white coats went into justification mode, defending our wonderful quarantine measures – and did we sense their palpable relief when the woman in question came up with a negative to the virus ? What wasn’t so well highlighted was how the nurse voluntarily put herself into in-house quarantine and helped cover the naked arses of her employers and the quarantine specialists. Bob, in his ten gallon hatted wisdom pointed out that this lady had landed in Perth airport and transited to Melbourne airport before she finally landed in Townsville. There you go – chances for not one, but three planeloads of fellow travellers – plus everyone else at those locations to have gone down with this deadly disease – had she been so unfortunate to have actually had Ebola. It’s a mind-numbing catastrophe waiting to happen. Fascinating to see how the good people of Texas are responding to their actual real thing crisis. For some reason, Bob, going off like a sack of prawns in the sun seemed to make sense in my mind (I know…. I’ll need to get this checked). He was suggesting that while Australians are heroically responding to the call to help the peoples of West Africa in ways that make a lot more sense than random bombing the poor Iraqis again, it would be prudent for the Australian immigration minister or the foreign affairs minister or the clown posing as the Australian Prime Minister to insist that non-aid people do not travel to West Africa. And as a useful afterthought – anyone who has been there should be obliged to spend three weeks in some resort island – preferably excised from the Australian territorial waters. Say, Manus Island, Christmas Island – or somewhere that the medical care is second to none – like say, Cambodia. Just in case. As Sam Kekovich says “You know this makes sense”. So there we have it – in our own lifetimes – ice skating with the devil. 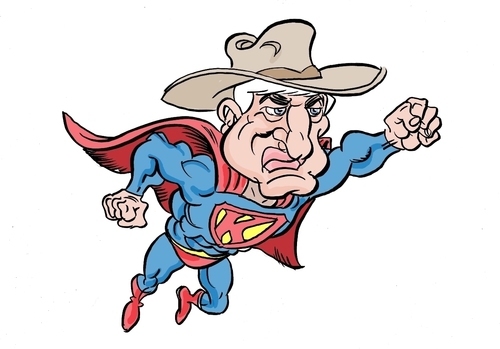 It’s a sad government when people like Bob (all hat and no cattle) Katter, make more sense! They do hysteria well up there. How’s this for a workable solution, Viv. I won’t sit on yours if you don’t sit on mine ? I noticed. As long as she did have a number two on the plane I think they’ll be right. Don’t sit on toilet seats has always been my motto (except for at home on my own seat).